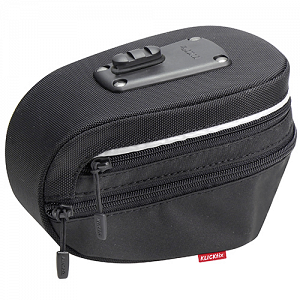 Big elegant saddle bag with expandable volume. Equipped with reflector and saddle adapter. An O-ring damper ensures that the bag attaches without play and remains silent even over rough terrain. Wide opening for easy access. The compact KLICKfix saddle adapter easily attaches to most sport saddles. The accessory locks automatically when slid into the adapter and can be released by pushing one of the red buttons.